I have been spending some time working on homeschool materials for Sadie this week. She is a smart girl, but there are some areas where I want to spend some time. Aspergers is not a “disability” in my view, but she does need to be taught some things on purpose, where other kids are simply catching these ideas. This is an area where Sadie is a bit lacking. Some days she plays pretty well with her siblings, but some days, she screams if they accidentally bump into her. I try to be quick to intervene and explain to her very simply that it was an accident. I just received a book called “The New Social Story Book .” Each very short story explains the importance of things like smiling and asking for help. Again, every child needs to learn these things, but Sadie needs to be taught them on purpose. We read a story about a party. Sadie was having a difficult time reading the emotions on the peoples’ faces. So we play a little game now. I say, “Sadie, show me your happy face!” She gives me a big grin. Then she shows me her sad face, and she sticks her bottom lip out. Very cute! I think this book has great potential, particularly since I can edit the stories, and the author demonstrates how I can write my own for various situations. Does she still run around screaming when she’s wound up, keep her sister awake at night, and sit on the front porch crying because she can’t get the door open with mittens on? Sure, but at least we have a plan now. Okay, at age four, people besides mom and dad are supposed to understand a child. What if Mommy can’t always understand her? Perhaps we need to put a little work into this area. There is definitely frustration when patient Momma gets pushed over the edge because I haven’t got a clue what she is trying to say. Some days I can interpret, but some days I feel like we’re at an impasse. I was very excited to find a speech therapy guide specifically designed for homeschoolers. Super Star Speech: Speech Therapy Made Easy is waiting for me to sink my teeth into. 🙂 I will be sharing more on this at a future date, once we can try it out. I have discovered that Sadie is very content with any kind of paperwork. She loves copywork, coloring, numbers, cutting, gluing, etc. Today she did the Hebrew copywork for Toldot. She enjoyed cutting up the puzzle and trying to put it back together. I also have her draw pictures of what we have learned, and she loves working on her numbers with our Matrix Math program. I am so thrilled to see her attempting to make letters by herself. Till now, she would only trace over letters, perfectly, by the way. Now I am helping her form the letters as we work through the alphabet. She is doing a great job. I am very pleased that as I challenge her, she rises to the challenge. She often behaves like a baby, so it is easy to assume that she couldn’t handle real school work. But I was wrong. The more I include her in school, and give her work just for her, the better she does. When I give her a task, she works diligently, and often I tire of it before she does. As you probably know, I have six children, four actively doing schoolwork. We have done some neat stuff this week. Isaac got 98% on his math! I knew he could do it. He just prefers to daydream, rather than apply himself. We will be working on encouraging him to put forth more effort. We have been using notebooking alot this week. I printed off several blank sheets to have handy. When I read something out loud, I hand them a sheet. They draw a picture and then write about it. Holly and Isaac tell me what they want to write. I write it neatly for them on their sheet. Then they copy it. Naomi is required to write two sentences by herself. Then I help her correct spelling, punctuation, and capitals. At Isaac’s incessant pleading, we have begun to study human anatomy. 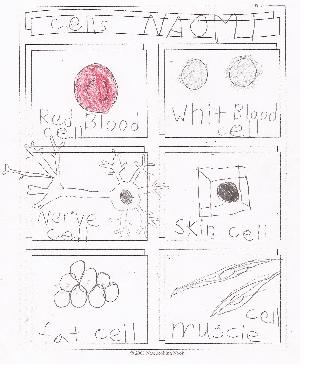 Sadie and I made a cell mobile to illustrate different kinds of body cells. Then they each picked six kinds to draw. Their drawing ability never ceases to amaze me.
. Wow! I never knew my digestive system was so complex! I hope you had a great week and a happy Thanksgiving!